Over the past several weeks I'd noticed an increasing vibration as I drove. It would start at about 30mph and then seemed to fade away as I went faster. However, over time it stopped fading away and became even more noticeable the faster I went. And, it started to happen at slower speeds too. Furthermore, the vibration would go away the second I lifted my foot off the gas to coast, or shifted into neutral. It wasn't at all related to engine speed. 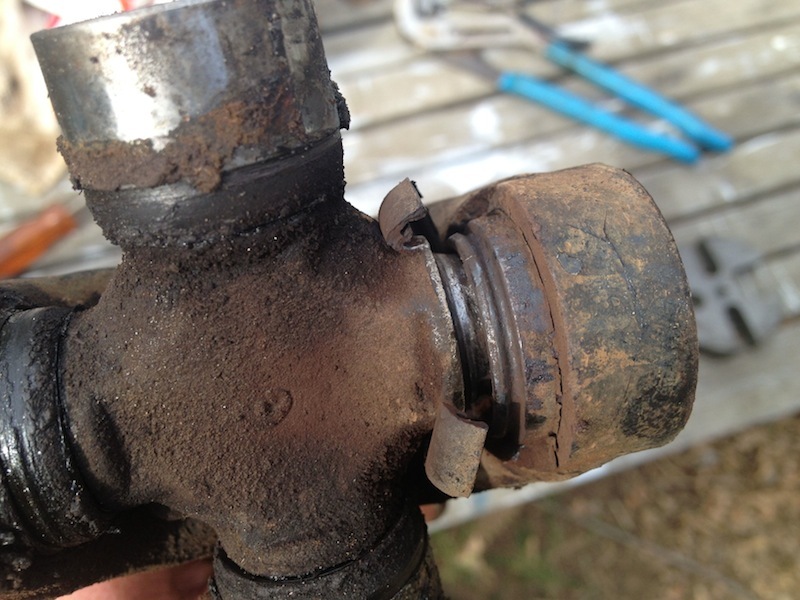 A quick query amongst the JeepForum crew offered the consensus view that this was a classic sign of failing u-joints. So, on a nice sunny Saturday afternoon in March (there are some benefits of living in California) I crawled under the Jeep and dropped the rear drive shaft. This is easily done with a 1/2" wrench (at least on mine). Takes about five minutes. Sure enough, one of the boots around the rear differential joint was torn and it was clear that the spider wasn't seated properly within the cap. Also, if your joints have zerks for greasing, remove them now. Here you can see two of the bearing caps—one "normal" and the other completely dry and missing all of its needle bearings. That was the culprit. Note also how the spider wore into a concave shape after constant rubbing against that dead bearing cap. Into the garbage the old joints went. If one is going to replace the joint at one end of the shaft, might as well replace both. I used Spicer 1310's. Don't use cheap no-name u-joints, the savings isn't worth it when you have to replace them twice as often. After a thorough cleaning of the yokes at each end of the shaft, including particular attention to the retaining clip grooves, it was easy to seat the new u-joints in place. 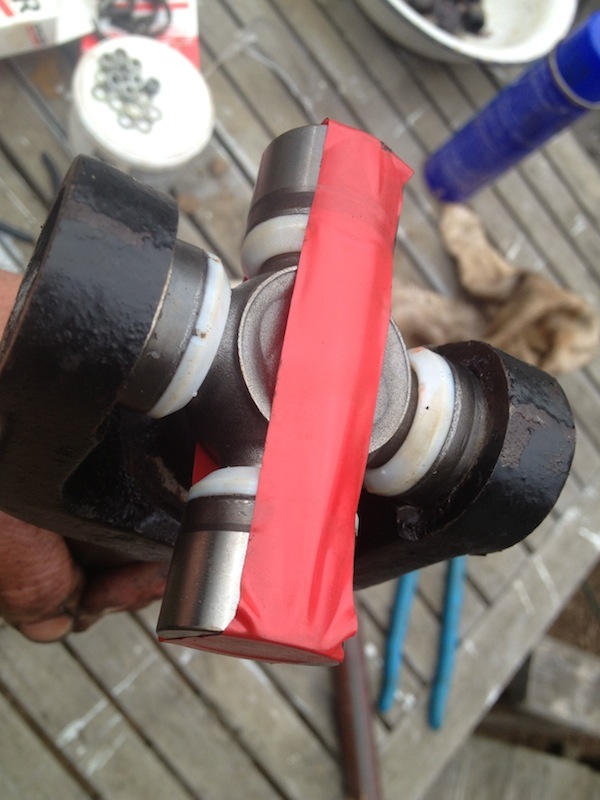 One may carefully remove two of the bearing caps. 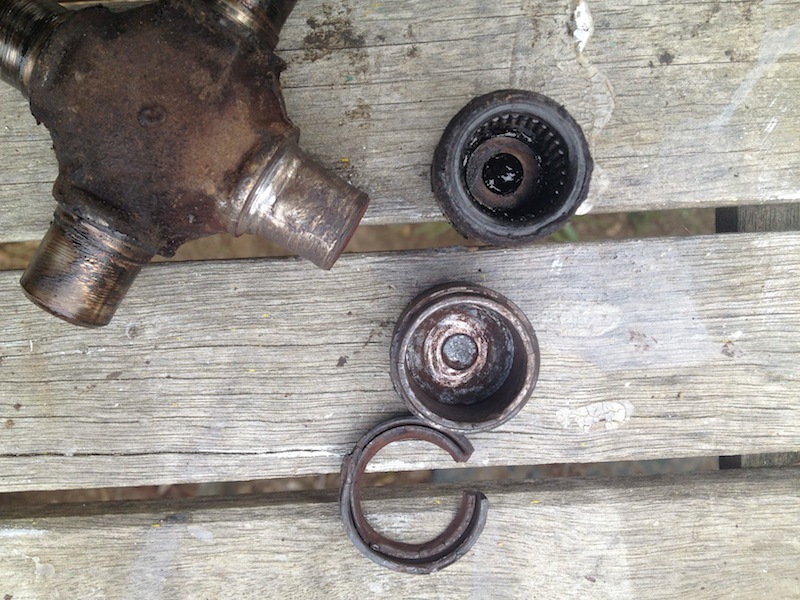 The bearings won't simply fall out—they are well-packed in grease from the factory. Just don't bang 'em around and you'll be fine. Insert the joint into the yoke and press the cap home. Install its retaining clip. Then, from the other side, press home the other cap, making sure to drive things down so the first cap is firmly against its retaining clip. Then install the second clip. After that you might find it helpful to carefully nudge the joint back a bit to center it. It should turn freely within the yoke. A helpful thing to do, as pictured here, is to wrap the other bearing caps with tape to prevent them from falling off at just the wrong time while crawling back under the vehicle. Before reinstalling the shaft it is a good idea to clean the mating surfaces on the differential and transfer case yokes as well. Any crud in there may prevent the u-joint from firmly seating—and if it isn't firmly seated on one side you'll have more vibration when you drive than you ever experienced with a failing u-joint! Ask me how I know. Torque things down and off you go! It's also a good idea to check those nuts a week or so later to make sure they've stayed put. Final bit of advice: when you pull the drive shaft, be sure to either 1) not separate the two parts (i.e., slide the shorter end off the splined longer end); or 2) before you *do* separate them, mark them using paint, an awl, punch, something so that they go back together exactly as they were. You don't want them aligned with each other in any other way since the shaft was balanced as it currently is.